Hello and happy Wednesday! 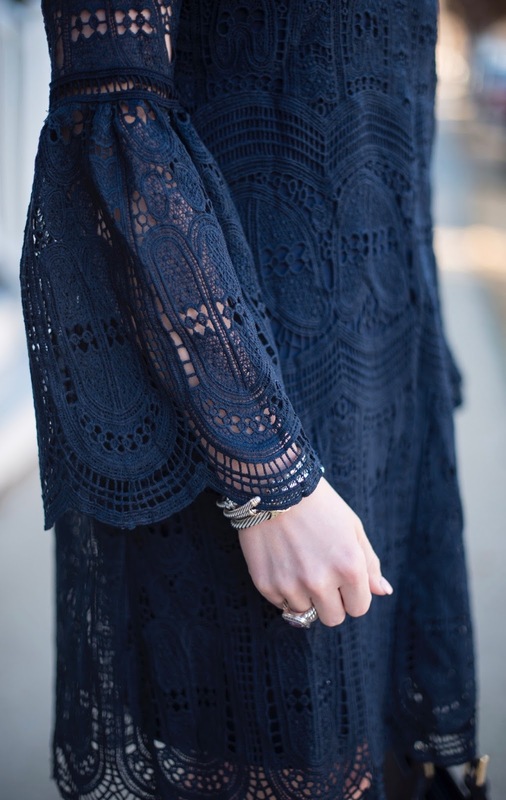 Today's post is featuring this gorgeous crochet dress. I have found that I tend to keep more navy dresses in my closet than any other color. I like to think of it as a LND (little navy dress). I am more than obsessed with the gorgeous sleeves of this one. It's only $59! I was sad to see that the navy appears to be sold out, however there is a good chance it could be re-stocked! It also comes in white...how perfect for a bride-to-be! I also want to mention that it does run large. I'm wearing a size small, but still had to have mine taken in to fit as a smaller size. If you love this dress in navy, then be sure to check out this one as well! It's sooo gorgeous! I wore it in white for Easter last year and am so excited to see that it has come back for this year. I hope y'all are having a great week so far! The sun finally came out yesterday after lots of rain, so we were able to shoot some looks for this week. There will be more to come tomorrow and Friday. Also, it's birthday week for my family! Today is my brother's birthday, tomorrow is my grandfather's and Friday is my Mama's. Between January 2nd and February 4th, we have five birthdays in my family! Do any of y'all have a certain month where several of your family members/loved ones have birthdays right around the same time? How'd you curl your hair? I use the T3 Whirl Trio Interchangeable Styling Wand! It's amazing :) Hoping to get a tutorial up soon! This dress is so cute on you, Rachel! I love chic and classy it is!